There are two things we can say about MELOTRON: A good thing and a… good thing! Too good to be true? No, no, no this is not the case! Once their music gains your interest, you keep on listening to it again and again. 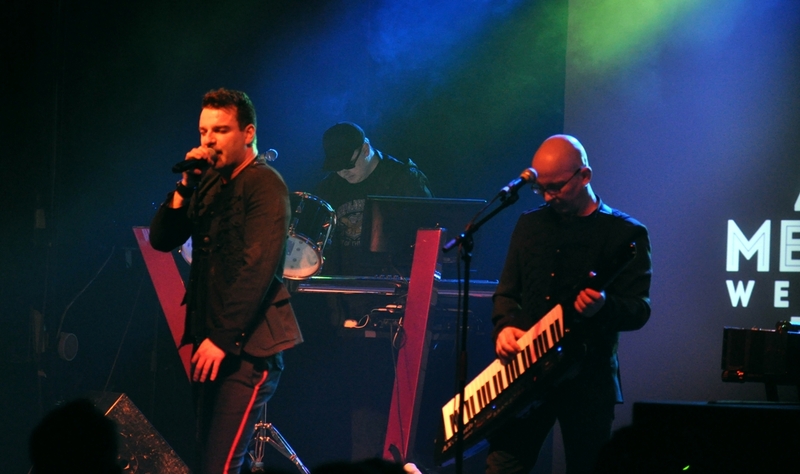 This German band has stepped into the music industry since 1995, having already released 4 studio albums ( Mφrderwerk-1999, Fortschritt- 2000, Weltfrieden-2002, Sternenstaub- 2003 ), heading slowly but steadily its way to worldwide alternative – synthpop acceptance! The strongest point about Melotron is simplicity. They are creative, intelligent, non-conformist and give more care to details. Still, the musical result is not complex at all. On the contrary, their songs are so easy to listen or dance to their rhythms, like all genuine electro songs are! During their “sternenstaub” tour, they participated at the “Seelenschmerz festival”, so we had had the pleasure to track them down in Athens, Greece. After their warm welcomed, excellent show at the club Gagarin 205, we met them backstage, where the following interview was taken. When and how did you get together?All of us used to live at the same street. Our houses were situated very close to one another. 14-15 years ago, we decided to start playing music together. We were listening the same kind of music… that was the problem but also the idea. We wanted to make our own music! So, it all started in 1991. Which is the concept of Melotron? How do you see it expand into the future?Edgar: I started this because I want to explain myself to the world, to express what I think and what I feel, as simple as this!Andy: We want to make music and live through music. We don’t know how things are going to be in 2 or 3 years. We are part of the music industry and, sometimes, people in this business change their minds about a genre, a band, etc… We only want to make music and be happy with it! That’s all! You are three different persons. How do you combine your three different ideas-views when you work on new material?Edgar: Each one has his own ideas and every time we get together we talk about them and decide if or what we’re going to do about them. When Andy is not happy with the lyrics, I try something different and when he’s got a bad melody, he gives me a new one. When we’ ve created something new and we are both happy with it, we pass it on to Hilde to hear it and share his thoughts with us. If he likes it too, we proceed and here’ s a new song! Has there ever been any problem? We’ve heard rumors that you had had problems with each other?Yes, it’s true, but it belongs to the past. You see, it’s like all kinds of relationships. It’s normal to have arguments, isn’t it? There was an argument about the music, not as heavy as people say, though. We sorted it out and this is why we are still together after all these years! How difficult is it to find your own style among all these bands playing electro-synth-pop?First of all, we are the only electronic pop band from Germany who sings only in German. This is much different! Five years ago, we used to think that we would only play live in Germany, only in front of the German audience. We thought that in other countries the language would be a barrier but, fortunately, it’s not! They get crazy when we speak German! Moreover, our melodies and harmonies differ from others. We like using new techniques on every album, we don’t want to repeat the same things or adopt a certain mode in everything we do. When we want to get inspired, we listen to every kind of music, like the Smiths and Leonard Cohen, certainly not music from this scene. So… the use of the English language is out of question? What about “2 young 2 die”?It was actually our first song and it was an experiment. We had another band (the Vermin) before Melotron. Parts of our songs were written in English and other parts in German. But we realized that we prefer using only German because we express ourselves better. It is our language, we can say more to the people through it. You get a different feeling when you sing in your mother tongue. Another thing is that most of our fans are German, so we find it kind of strange to be on stage in Germany and speak in English! We haven’t heard any complaints from people living abroad. On the contrary, we’ve met people who have translated our lyrics and they have really enjoyed them. Some have said that, when they want to listen an English speaking band they go to an English or American band, but when they want to see a German band, they prefer listening to German lyrics. What about the image? You don’t find it necessary to be dressed in black or in strange “dark-space-cyber” outfits, do you?When we are on stage, we are ourselves. We don’ t need a mask for the show. We want the people to see a show, to have a party, to dance and go home saying “it has been a great evening!”. It’s totally equal in which way a band chooses to succeed this. If an artist wants to be dressed up like… whatever… then he should do it. Otherwise, he shouldn’t! Tell us about your new label, SPV.Everything about SPV is positive. We’ve got a friendly relationship, which is not what usually happens with the record companies. When we have a meeting with SPV people, we drink a beer with them and make plans. We don’t only talk business. Most of the times, we can do whatever we like. They only make comments when we get TOO creative! There’s a friendly atmosphere, which, in fact, is professionalism. What exactly did you want to say with Weltfrieden (=world peace)? Is it a straight political statement?Edgar: “Weltfrieden ist kδuflich!” is a sarcastic comment on American politics. The U.S. government has always tried to make peace to the world using weapons! So, what we say is that you can buy “peace” from Americans. We have friends in America who don’ t think this way. The problem is the government of the U.S. that believes it’s the greatest and acts as if it knows what measures should be taken. In my opinion, it knows nothing. As a result, its tactics bring more problems to the world instead of solving them. Many German bands have been accused of having fascistic ideology. Do you think they should spread this ideology through their music and influence young people, who see them as idols?Everybody is free to express his/her ideas. But they should think about them first. As a musician, you have the chance to see and speak to the world. We don’t understand artists who travel round the world and don’t realize that, no matter how different we are, we are all the same, we are all humans. O.k., you may not like every person on Earth, but it’s not because of his nationality, his color or the characteristics of his face! Are you in favor or against the copy protected policy on cds?No, we are not in favor. We too used to “burn” cds when we couldn’t buy them. We didn’t have an alternative way to listen to our favorite music. Copying a cd isn’t stealing, it doesn’t turn you into a criminal! This is just what the music industry and many bands claim. We believe it’s not a problem. They are our childhood! We come from East Germany where things have been different. DM was the first major band we got to know its music. How did you get to work with Dennis Ostermann (In strict confidence)?Edgar: In 1999 I played as a keyboarder with “In strict confidence” at the States. During that tour, we had said that it would be nice to collaborate in the future. So, when we were at the studio working on “Brόder”, we thought that an aggressive voice suits the song better. I called Dennis and he accepted to sing it for us. Any other collaboration you would like to have?Andy: Maybe in the future, maybe for the next album, but not from the scene. At the moment we want to experiment on mixing different styles. In less than 8 weeks we’ll be back at the studio to start recordings for our next album and we would like to work with musicians playing classical instruments, not with famous artists. New album? So quickly? You are very fast!Yes, we are! A new album with classical instruments added to your sound ….mmmm… it sounds very interesting!Yes, indeed! How is it like being on tour with And One, Front 242, De/Vision, Mesh, Covenant?We had had a really great time with all these bands! No troubles, a lot of fun! Everyone and everything were truly great! How difficult is for an electro band -without a major budget show- to attract people’s attention while giving a concert?Andy: There is one very important thing to do: Be yourself. Be true. The people can see this and get the feeling. This is enough, believe me. Edgar: We don’t intend to be the best live performers, you know. We work hard at the studio in order to be prepared for a good live concert. The people want to hear good sounds, a good voice and good singing. They are not interested in how many notes we are playing in a second. They come to see an electronic band and we don’t play the guitar or drums because we can do everything with our synthesizers. Any favorite concert you’ve attended?Andy: I believe that a good band gives good concerts. When you see a band like DM playing, you understand why they are so big, right? Did you enjoy your show in Athens?It was fun! We had a great concert! I think the audience had a great time too. Is there anything you’d like to say to your Greek fans?Andy: It was a great weekend over all. We’ll be back next year! Thank you very much! Bitte!